Leipzeg will see the world premier of the e-Golf dressed for duty with the boys in blue. Volkswagen is now offering the new e-Golf as a specially equipped, emission-free police emergency vehicle, modified slightly from the version available at dealerships around the world. This fully operational suitable compact vehicle comes in the standard Police blue-silver livery with special signal conditioning and digital radio. 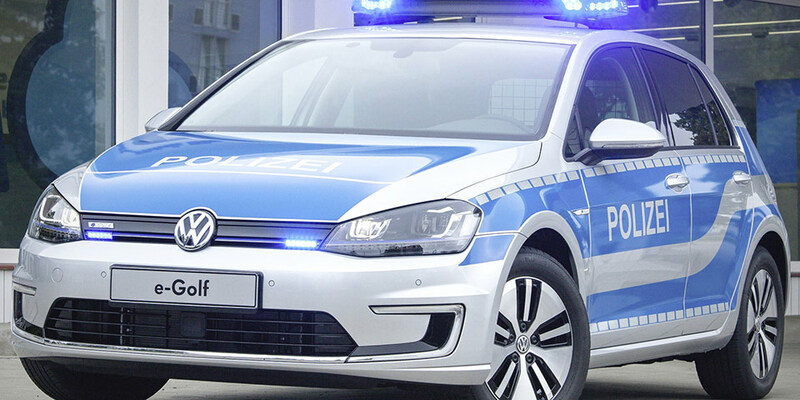 Before the e-Golf will begin its police duties, the model will make its world premiere at the International Trade Fair for Police Equipment in Leipzig on September 9th. But what is the real point of this? Is it just to have an environmentally friendly police car? Does it have advantages? Will it be used mostly for parking or patrolling in pedestrian areas? I don't see why you had to start off by asking me "what I mean". Its pretty obvious and you gave a fairly good answer to the question, so maybe we can tone down the tude a bit. I was simply thinking that these vehicles can't go quite as fast as many other vehicles on the road. Its also smaller so its not going to be ramming things, etc.. I was just wondering if it being electric had any other benefits to the police force other than saving fuel costs. And given that this is happening in Germany, I think the environment probably was considered. Germany has an extremely green energy base and focuses a lot on that. Their green party even wins seats in elections. Is it bad that I really like this? Would give anything to unlock that in a video game of some sort...I mean, i'm never gonna get my own one am I?